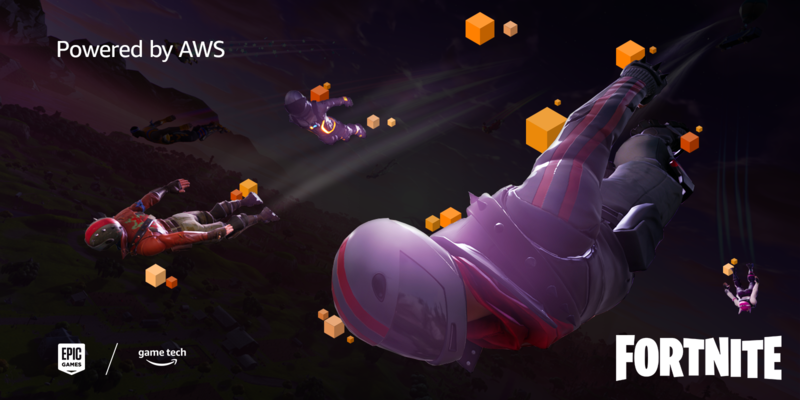 Fortnite creators Epic Games goes all-in on AWS services, as revealed at the AWS Summit at the Javits Center in New York on 7/17/2018. Imagine your game had 125 million players. 125 million. That’s 15 times the size of New York. All those people playing your multiplayer game would be a dream come true, right? You’ve got to ensure they’re all having a great time. How would you handle all that data from so many people? That’s the situation Fortnite creators at Epic Games found themselves in this year. The remarkable growth of Fortnite means Epic Games deals with two petabytes of data each month! Picture a stack of 2,000 terabyte hard drives. How does any game developer process that amount of information? Well, you need a robust set of cloud services, as Chris Dyl, Director of Platform at Epic Games, told the AWS Summit in New York today. Fortnite’s success is down to its fast-paced scavenge-and-survive style of play, set in a map with opponents from all around the world. Its slick mix of building and fighting has made it popular with gamers everywhere – several international teams in the recent soccer World Cup spent their time between matches playing Fortnite! – as well as an inspiration for other game developers. “Fortnite has become a pop culture phenomenon across the world and we’re very proud of its success,” said Chris. Chris and his team can follow all the game’s interactions and can assess design decisions, identify player sentiment, and adjust critical elements of the game with analytics tools from AWS. “We use this to monitor the quality of service we’re providing our users from the point of view of the client,” Chris told AWS Summit attendees. Fortnite runs on Epic Games’ Unreal engine. Any game developer building their game on Unreal engine (or any other major game engine) can use these AWS services today to power their own game. Epic Games was founded in 1991 and released Unreal, which gives its name to the engine, in 1998. The Fortnite battle bus first took to the skies in 2017; the title is now available on seven different platforms across computers, consoles and mobile devices. With the help of AWS services, including analytics, machine learning, and containers, Epic Games continually improves its gameplay. “We’re excited to work with AWS to expand our use of analytics, machine learning, and containerized applications using Kubernetes to make our sizeable infrastructure even easier to maintain,” concluded Chris. You can download Fortnite for free from https://www.epicgames.com/fortnite/en-US/buy-now/battle-royale. You can get the Unreal Engine from https://www.unrealengine.com/. See what Amazon AWS cloud computing services can do for your players at https://aws.amazon.com/gametech/. Catch up with the expert talks from the New York AWS Summit with videos online at https://live.awsevents.com .